Frank Castle continues his run as the anti-hero vigilante known as The Punisher, in War Zone. The Punisher identity was born out of the murder of Castle's family after witnessing a mob execution in New York City's Central Park. The loss of Castle's family drove him to wage a one-man war against the mob and any other criminals that cross the Punisher's path. War Zone finds Castle six years into his vengeance filled pursuit of the mob, taking direct aim at Jigsaw, one of Punisher's most notorious of villains. Lexi Alexander director of Green Street Hooligans, takes on the third installment of the Marvel comic series The Punisher, with an abbrasive pleasure for the darker tones and violent nature to the books. Alexander's incarnation, takes on the Marvel Knights imprint of the Punisher, which was penned by Garth Ennis and drawn by Steve Dillon in a 12 issue run. The series much like Alexander's portrayal, returned Castle's character, to its lone vigilante roots and is deeply embedded with crime focused stories that are rich with black humor throughout. "Great now I have brain splatter all over me" and "just in time for happy hour," are great examples of the tongue and cheek humor that is packed into Punisher: War Zone. Alexander is also equally unbashful with Castle's crime fighting tactics, never holding back with massive amounts bloodshed, gore and gunplay that comes hard and fast, from beginning to end in War Zone. The imagery of Punisher: War Zone is very comic book in nature and although is set in New York City (thank god were not in Miami), most of the sets and scenery are hard to believe as anything you would see on the streets on New York, but instead something you would see in the pages of the comic. The church that Castle visits instantly reminds you of a drive through neon church you would find on the Las Vegas strip, not New York. The subway system within War Zone is lined with neon green lights that leave no correlation to New York City. The detached imagery, while trying to remain natural, instead creates a surreal world that matches the dark humor and grim feel to Alexander's interpretation of the Punisher's brooding bravado that I enjoyed. Ray Stevenson, perfectly embodied the persona of Frank Castle/The Punisher more than any other actor before him, in a couple of ways. First off, he has the look. Stevenson's size and stature alone do wonders for the role. Tom Jane was great as Punisher, but Jane lacked the grit that Stevenson just drips of. Ray Stevenson is a deadlock with his delivery of Frank Castle a.k.a. The Punisher, so much so, I completely forgot about Jane or Lundgren. Stevenson is a talented actor regardless of lines, and perfectly conveyed true brutality from start to finish. Stevenson in fact, thrives with limited dialogue in War Zone, never losing any of the retaliative impact. It is worth noting, that Alexander and co. did an all round impressive job with the Punisher's uniform and weaponry. His fatigues and weaponry, clearly matched the concept that Frank Castle has had extensive weapons and military training prior to his days as a vigilante. Punisher: War Zone marks the first time in any of the Punisher films, that Castle isn't merely taking down just mobsters or japanese triads, instead he faces an actual villain. The Punisher actually himself creates Jigsaw, when he leaves Billy Russoti for dead, terribly mangled and disfigured. Dominic West takes a different approach for Jigsaw playing the character extremely comical, very similar in nature to the Garth Ennis written comics. West's performance borders on zany in spots, but overall is a pleasent surprise. Jigsaw and his gang give War Zone much of its campy feel with the over-the-top persona's of Jigsaw and Loony Bin Jim, who is equally farcical as played by Doug Hutchison. Punisher's longtime comic book associate Microchip, makes his first appearence here in War Zone too. His named shortened to Micro, serves as Castle's supplier for high-tech weapons and machinery and is a usual source for humor and insight to the Punisher's abbrasive attitude. Wayne Knight, best known for his role on Seinfeld, does a good job with his role and provides a few good laughs in the gunplay free scenes. 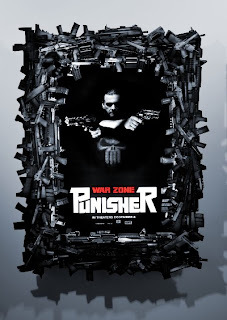 A refreshing aspect to Punisher: War Zone, was it didn't take itself to seriously. A very interesting angle with the current trend of ultra-real comic films i.e. The Dark Knight and Iron Man, which paid off. Punisher: War Zone is comical and not intended to be a deep and thought provoking film, instead it focuses on delivering pure brutality and action in a big way. For action and violence, War Zone does not let down, instead it comes at you unapologetically! Lexi Alexander brings the blunt violence from the get go, holding a steady stream of surprising and laugh-inducing kills just as fast as Castle, can unload another clip of bullets. A great kill, comes at the fate of one members of parkour-style gang, that is sure to get you laughing. Thankfully, Marvel and Alexander approached War Zone with a hard R rating, which well played to the vigilante persona of the Punisher and ultimately made for a hostile and thrilling bloodfest. Punisher: War Zone is no Iron Man or The Dark Knight, but it is none the less a fun and rousing good time. Lexi Alexander took on the Marvel Knights identity of Frank Castle and in doing so provides, a ferociously comical and viciously stimulating Punisher film. If you go in expecting serious, you may be disappointed, but if you go in expecting a bloody good time...you'll get it!